THE OCTOBER BLOG WAS WRITTEN BY, SALES ASSOCIATE RAVEN WILLIAMS WHO IS ALSO A MEMBER OF WILLIAMS FAMILY SHOWPIGS. THE BEAUTIFUL LEAVES OF AUTUMN ARE FALLING, BUT THERE ARE A FEW SITUATIONS WHERE HORSES AND TREES DEFINITELY DON’T MIX. MAKE SURE YOUR HORSE PASTURES DON’T HAVE THESE TOXIC TREES. PROTECT YOUR HORSE BY LEARNING ABOUT THE TREES AND LEAVES THAT POSE THE BIGGEST HEALTH RISK. Fall is here! The leaves are changing and the temperatures are cooling off. It’s hard to imagine that such a pretty time of year could possibly be harmful to our horses. However, fall leaves can pose a potentially deadly threat. The following are trees that are highly toxic to horses. 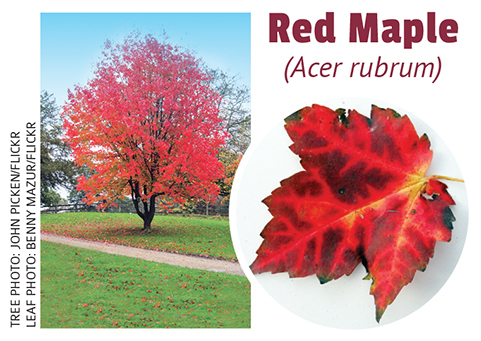 Red Maple (Acer rubrum) Poisonings occur generally in late summer and fall, when leaves fall and drift onto pasture area. Red Maple leaves are highly toxic to horses. Ingestion of one and a half pounds is toxic, ingestion of three pounds or more is fatal. Death is common in cases of red maple poisoning, due to massive destruction of red blood cells. Signs include breathing difficulty, jaundice, urine that is dark brown in appearance, increased heart and respiratory. Do not put leaves in hay and make sure there are none within reach of the pasture area. In case of ingestion, call your vet immediately. Eastern Black Walnut (Juglans nigra) Black walnut can be introduced to horses through trees that grow around the pasture and land or, more commonly, as shavings used in stall bedding. Shavings with less than 20 percent black walnut content are toxic within 24 hours of exposure, but are usually non-fatal with proper treatment. Signs of black walnut toxicity include laminitis (which will worsen with continued exposure), reluctance to move, increased temperature and heart rate, difficulty breathing, digital pulse, limb edema, and increased gut sounds. Remove stall shavings immediately. Cooling the legs and hooves with a hose can help make the horse more comfortable. If caught relatively soon, recovery should be complete. In cases of severe laminitis and edema, consult your veterinarian. 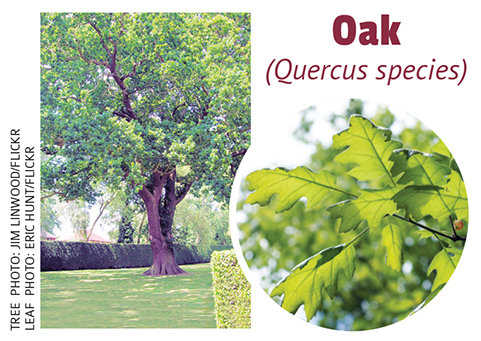 Oak (Quercus species) Oak trees in horse pastures should not be cut down, but branches should be kept out of reach of horses. Horses should be fenced out of areas where wilted oak leaves and/or acorns are plentiful. In large amounts, the leaves and acorns are poisonous to horses due to the toxin tannic acid and they cause kidney damage and gastroenteritis. Horse owners are encouraged to fence off oak trees from their pasture, especially if forage is scarce. Symptoms of poisoning include lack of appetite, depression, constipation, diarrhea (which may contain blood), blood in urine, and colic. Do not dispose of your raked leaves into your pasture. Horses like the taste and smell of recently fallen leaves. Leaves are dense and can compact in the horse’s digestive system and cause compaction colic. Leaves may also come from plant species that are poisonous to the horse. Be aware of leaves and trees that are toxic to your horse and fence off wooded areas or fence rows that contain possible toxic substances. If branches fall into the pasture make sure they are removed immediately. This article was originally published in the September 2014 issue of Canadian Horse Journal. HAVE YOUR TIRES HAD ONE TOO MANY BIRTHDAYS? an extended period of time not being used? If so, this information is especially important! ♦Tires have identification markings located on them that will tell you when a tire was manufactured. 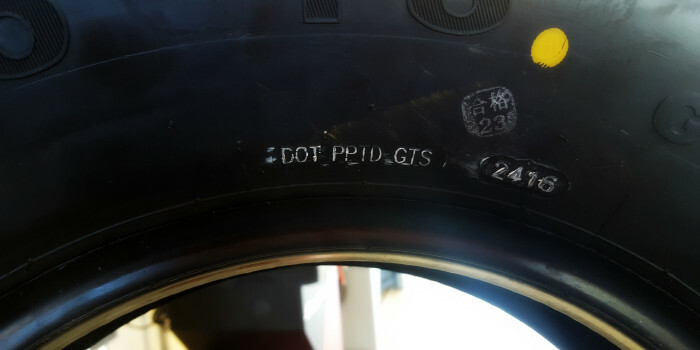 unique to the manufacturer, along with the week and year the tire was manufactured. Tire Identification Number including the manufactured date of the tire. happy to help! We offer FREE tire inspections and can order any tires you need at a competitive price! questions or thoughts, please let me know! Stop in and see me, call, or email. Matt@lancestrailersales.com.